Want to treat that special someone this Valentine's Day? 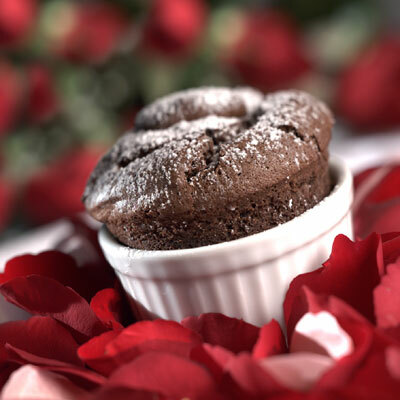 Tempt them with this tantalizing recipe for Hidden Treasure Chocolate Soufflés - a surprisingly simple-to-make delicacy that is sure to please. Savor the intense flavor of the rich chocolate with a creamy caramel secret hidden in the center. It's a sweet treasure that will fill both of your hearts with love. PREHEAT oven to 400° F. Spray two 6-ounce ramekins or custard cups with nonstick cooking spray; coat lightly with granulated sugar. MICROWAVE morsels, butter and cocoa in medium, uncovered, microwave-safe bowl on HIGH (100%) power for 45 seconds; STIR. The morsels may retain some of their original shape. If necessary, microwave at additional 10-second intervals, stirring just until morsels are melted. Stir in egg yolk and vanilla extract. BEAT egg white in small mixer bowl until soft peaks form. Gradually beat in 2 tablespoons granulated sugar until stiff peaks form. Stir one-fourth of egg white mixture into chocolate mixture to lighten. Fold in remaining egg white mixture gently but thoroughly. Spoon into prepared ramekins, filling about 3/4 full. Drop 1 bite-size chocolate into center of each soufflé; press in slightly. Place soufflés on baking sheet. BAKE on center oven rack for 16 to 20 minutes or until puffed and center still moves slightly. Sprinkle with powdered sugar. Serve immediately.